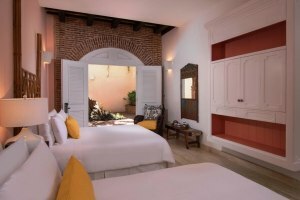 Implementing a spellbindingly unique concept, Casas del XVI stands as a Colonial gem that pays homage to the greatest designers of the Dominican Republic in the most artistic manner. The beautifully adorned rooms are packed with sheer elegance and a dash of luxury. The private butler service promises to cater to every need of yours, for a fun-filled and relaxing stay. The hotel also houses a library and two swimming pools. Ideal for solo travelers, and couples and small families seeking a peaceful vacation, Casas del XVI is especially for those who admire and love all things artsy. The hotel offers the comfort of dining in the comfort of your room, or at the courtyard. Your private butler will arrange for anything you wish to savor, to ensure that your gastronomical cravings are satisfied. The Casas de los Mapas and Casa Macorís offer plunge pools for guests to take a cool, refreshing dip on warm afternoons. You could also ask your private butler to stir up a refreshing cocktail for you to relish on the sun loungers by the pool. Pets are allowed. However, charges may be applicable.